Last week, for half term, I travelled to Serbia. We flew from Luton and landed in Belgrade - on snow! In fact, after leaving Luton, we saw no tarmac, grass or any other man-made ground-level surface for almost a week! We picked up the hire car and my Dad drove on snow (banked-up to about 6 feet on each side) for around 6 hours to reach the resort of Zlatibor. It was a 45 minute drive to Mokra Gora and a further 30 minutes up a track just 1 car wide to the ski club's hill which was so small that it doesn't even issue lift tickets! I skied in 2 slalom races in Mokra Gora. It was an important race in Serbia and was covered on National TV. 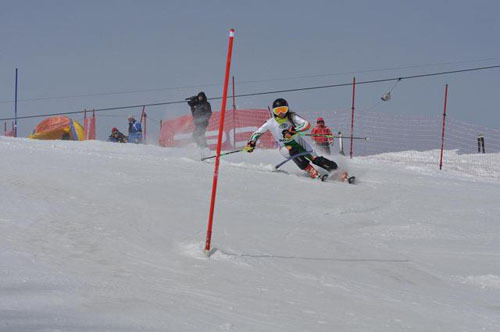 I then had 2 more slalom races at Tornik, close to Zlatibor. The people of Serbia were really friendly and seemed pleased that my sister and I had travelled to their Country for the races. 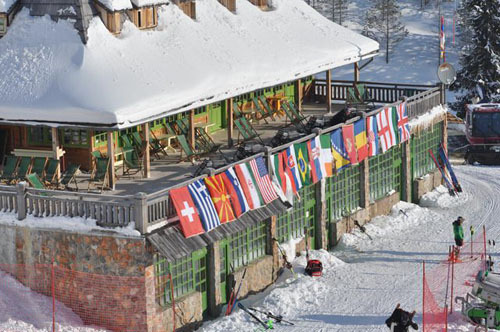 I have included a photo of the Mokra Gora ski slope's club house which was really pretty, as you can see with flags for athletes from all competing Nations hanging over the balcony. And a photo of my sister and me with the Irish flag. For spectators, it was also good because a cup of coffee was the equivalent of 50p! I hope to race in Serbia again in the future.